If your 2016 Thanksgiving dinner was shorter than usual, the turkey on your dining table may not have been to blame. Who you had dinner with and their political affiliations following last year’s divisive election may have shortened the holiday get-together by about 25 minutes — or up to an hour depending on how many campaign/political messages saturated your market area. It’s all in the data. 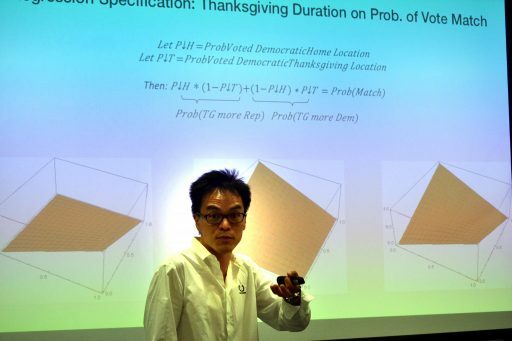 “It’s not that conservatives and [liberals] don’t like eating Thanksgiving dinner with each other; they don’t like eating Thanksgiving dinner together after an incredibly polarizing period,” said Keith Chen, associate professor of economics at the UCLA Anderson School of Management. 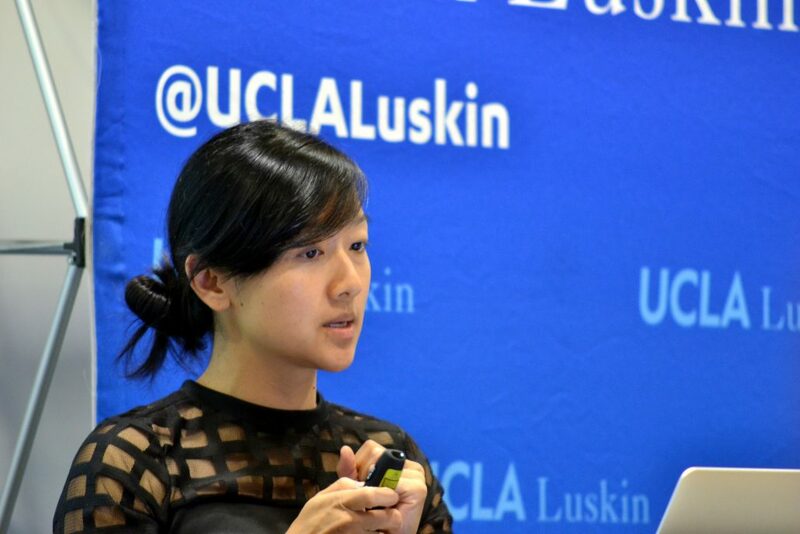 Chen was among a group of scholars and data researchers who presented recent findings on Aug. 25, 2017, at a daylong conference about computational social science and digital technology hosted by the UCLA Luskin Center for Innovation. 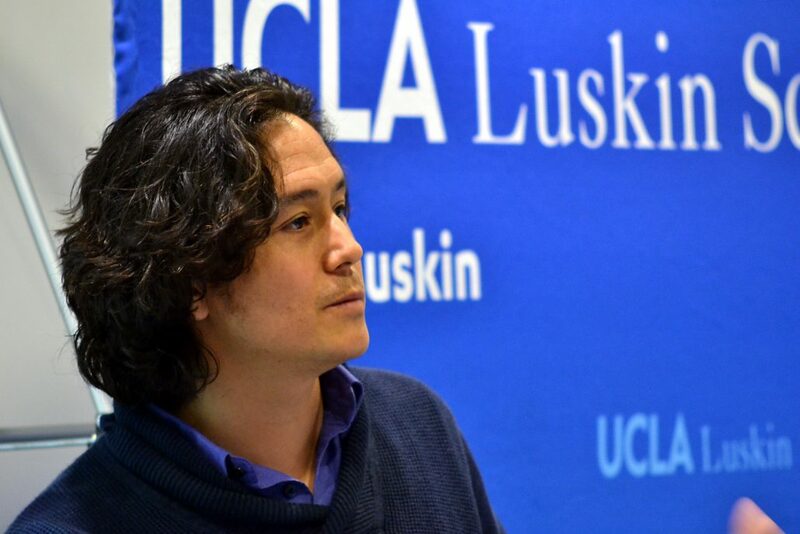 Information gleaned from social media and from cellphone tracking data can reveal and confirm political polarization and other topics, such as poverty or protest, said researchers who gathered at the “The Future of Humans as Sensors” conference held at the UCLA Luskin School of Public Affairs. The event brought together social scientists and data researchers to look for “ways to either extend what we can do with existing data sets or explore new sources of ‘big data,’” said Zachary Steinert-Threlkeld, assistant professor of public policy at UCLA Luskin and the leader of the program. 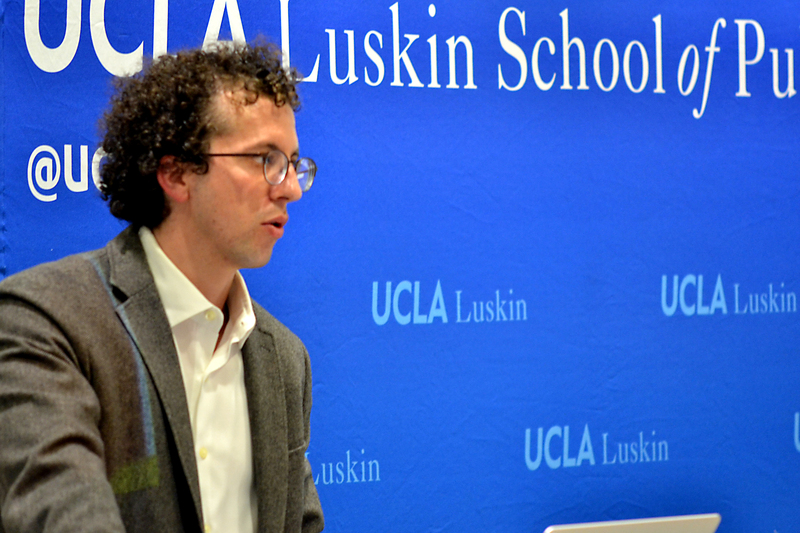 Zachary Steinert-Threlkeld, assistant professor of public policy at the UCLA Luskin School of Public Affairs, led “The Future of Humans as Sensors” conference and presented finding from his research on measuring protests with social media. Steinert-Threlkeld presented his latest research, which was motivated by the Women’s March in the United States, as an example of measuring protest with new data sources that include geo-located Twitter accounts. While conducting research, Steinert-Threlkeld has observed that working with social media data has actually become more difficult of late. “While Facebook lets you use data from profiles that are public, most people have private profiles,” Steinert-Threlkeld said. Seeing private data requires researchers to work directly with Facebook, which has become more cautious in the wake of a controversial 2014 paper, thus impacting what scholars can publish. In addition, Instagram previously provided much more data, but since 2016 it has followed the Facebook model and that data has been severely restricted despite Instagram’s norm of having public profiles, he said. “This workshop will discuss how ‘humans as sensors’ can continue to yield productive research agendas,” Steinert-Threlkeld told conference attendees. Talking about new and innovative ways to do this, Michael Macy, a sociologist and director of the Social Dynamics Laboratory at Cornell, began his presentation by pointing out the innate difficulties of observing human behavior and social interaction, as well as both the potential and the limitations of social media data. But, Macy said, new technologies in various scientific fields have opened up research opportunities that were previously inaccessible. Macy provided examples of ways that tracking of political polarization can be done, not by looking at extreme positions on a single issue but by inferring positions on one issue by knowing the position that individuals hold on another. This can range from their choices of books on politics and science to their preferences for cars, fast food and music. “The method seems to recover something real about political alignments … political alignment can be inferred from those purchases, and then we can look to see what else they’re purchasing,” Macy said. The day’s presentations also included the ways in which data can be used to provide rapid policy evaluation with targeted crowds and how demographic sampling weights from Twitter data could be used to improve public opinion estimates. Data could also help fight poverty worldwide. The world seems awash in information and data, but “most of world doesn’t live in a data-rich environment,” said presenter Joshua Blumemstock, an assistant professor at U.C. Berkeley’s School of Information and director of the school’s Data-Intensive Development Lab. Blumenstock discussed how data from billions of mobile phone calls in countries such as Rwanda could be used in conjunction with survey data to create a composite of where individuals fall on the socioeconomic spectrum. In turn, the information collected could be “aggregated up” to a much larger regional or national level. “And when you aggregate up, you start to get things that might be conceivably useful to someone doing research or some policymaker,” such as being able to respond instantaneously to economic shocks, Blumenstock said. In addition, instead of costing millions of dollars and taking years, he said this methodology could potentially cost thousands of dollars and be conducted in weeks or months. The massive Arab Spring protests that began in late December 2010 and spread from North Africa to the Middle East generated huge crowds and had quick and profound effects — including the overthrow of Egyptian President Hosni Mubarak, who had held a firm grip on the country for decades. “Protests occur as a result of decentralized coordination of individuals, and this coordination helps explain fluctuating levels of protest,” Steinert-Threlkeld wrote in the study, “Spontaneous Collective Action: Peripheral Mobilization During the Arab Spring.” Although not intended to explain the Arab Spring, Steinert-Threlkeld’s paper presents the first large-scale, systematic evidence of how individuals behaved in each country. “Having someone tell you, ‘Hey, I’m going to protest tomorrow’ is much less impactful than having multiple people tell you they are protesting tomorrow,” he said. Large groups of people, as opposed to a few central individuals, are able to discuss “where to go, how to get there, when to go,” as well as what is going on once there, Steinert-Threlkeld added. In addition, individuals debating whether or not to protest must receive a credible signal that large numbers of people are protesting. He added that many Muslim Brotherhood leaders were summarily jailed — even though they did not sanction protests — because the Mubarak regime assumed only they could have mobilized such a crowd. “This paper demonstrates the contributions big data can make to understanding processes of social influence in social networks,” he said. The wave of protests that erupted after Donald J. Trump’s unexpected presidential victory was no surprise to Zachary Steinert-Threlkeld, an assistant professor in the UCLA Luskin School of Public Affairs Department of Public Policy whose research focuses on spontaneous collective action and the mobilization of mass protests. “There were protests before the election as well,” said Steinert-Threlkeld, noting that most of Trump’s campaign rallies were accompanied by small altercations between his supporters and opponents. “But I would be surprised if it persists. These things tend to die out” as time passes. The ebb and flow of protest movements are one of the key elements of Steinert-Threlkeld’s research, which has looked primarily at the role of mass protest in countries where citizens rose up unexpectedly against authoritarian regimes. During the Arab Spring of early 2011 that helped topple governments in Egypt and elsewhere in the Middle East and North Africa, for example, demonstrations had begun to subside before an emotional interview with a Google employee about his secret incarceration and interrogation by Egyptian police sparked new protests. “Even in something as severe as overthrowing a dictator, there is a natural decay” in protest movements, Steinert-Threlkeld explained. Such mass actions tend to lose momentum unless new events arise to spark anger and trigger renewed focus, and this is likely to prove true in America as well. 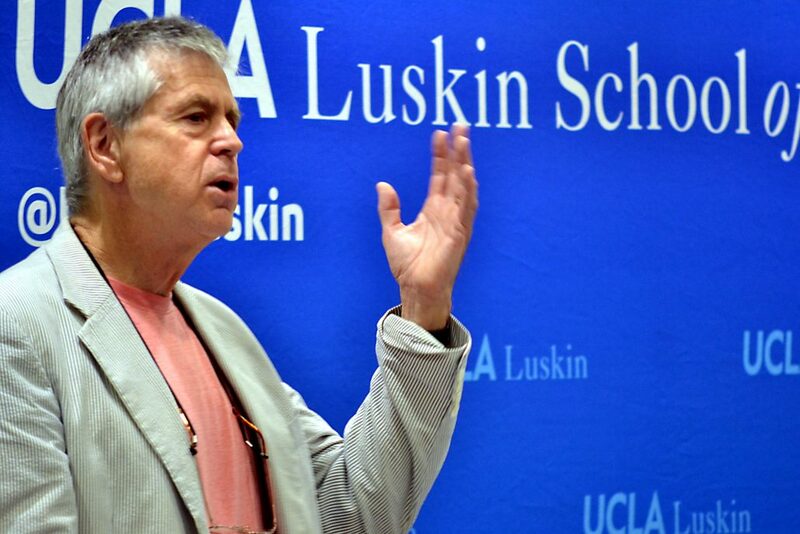 A new addition to the UCLA Luskin faculty this year, Steinert-Threlkeld said he has long been interested in collective actions, and that interest turned into serious research when the Arab Spring happened to occur during the first quarter of his first year in graduate school. His interest relates primarily to a desire to understand and analyze how people work together as groups, he said, not because he has any strong activist tendencies himself. His academic pursuits look, in part, at the nature of protest movements. Contrary to what some may think, Steinert-Threlkeld has found that group actions are most often driven by those on the periphery of a protest — average people whose motivation is spontaneous and rooted in emotion. Protest organizers and political activists actually have little control over whether people get together or stay together, he found. For instance, during the Arab Spring movement in Egypt, a protest organizer tried to put together a major rally early on, “and no one came out,” Steinert-Threlkeld said. One week later, the protest movement started around Cairo before converging on Tahrir Square. “Pockets of small protests sprang up around Cairo, with people just banging pots and pans, and walking through these narrow alleyways telling other people to come and join them,” Steinert-Threlkeld explained. The recent protests in the United States have primarily been peaceful, which is usually the more productive approach, according to Steinert-Threlkeld. At this point, it’s unlikely that a Republican-controlled U.S. Congress would be motivated toward impeachment of Trump. “It has to be those people who voted for him who would have to tell their congresspeople to impeach him,” Steinert-Threlkeld said. Barring a stunning change of opinion prompted by Trump’s actions as president, or disclosure of a criminal act on his part, Steinert-Threlkeld said it’s unlikely that U.S. protests will lead to “a regime change” as did the Arab Spring. 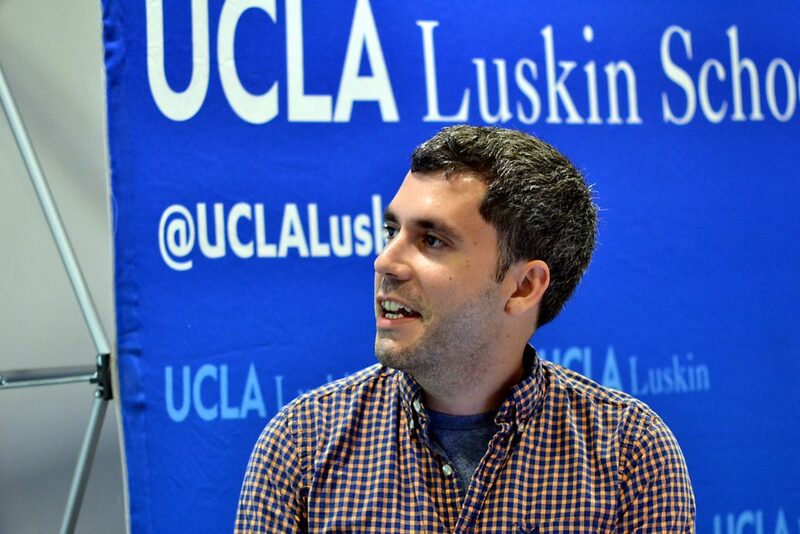 Zachary C. Steinert-Threlkeld is an assistant professor of Public Policy at the UCLA Luskin School of Public Affairs. His research interests are at the border of international and comparative politics, exploiting in particular vast social media data to study subnational conflict. His current research focuses on the mobilization of mass protest during the Arab Spring and Ukraine’s Euromaidan protests, as well as elite behavior and state repression in authoritarian regimes. Steinert-Threlkeld’s work has appeared, or is forthcoming in, the European Physical Review – Data Science, World Politics and the American Political Science Review. He received his Ph.D. in political science from UC San Diego in 2016; a master’s degree in political science from UC San Diego in 2012, and a bachelor’s degree in anthropology and economics from Washington University in St. Louis.